Pittsburgh old time musicians Mark Tamsula and Richard Withers share the music historically rooted in Southwestern Pennsylvania. 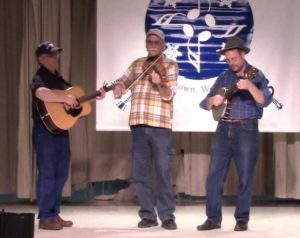 They perform tunes collected by the renowned music historian and Penn State professor, Samuel Bayard, who visited fiddlers and fifers in that region between 1928 and 1963, and published over 1000 of their tunes. They are joined by veteran guitarist Dave Krysty, also a pioneer in the revival of traditional music with local roots. Sam Bayard and his source musicians are gone, but Tamsula, Withers, & Krysty have brought their music back to life on fiddle, banjo, and guitar.